We have just a week of this desert trip left and want to get back to Wiley’s Well where we had such a good time two years ago, so it is time to hitch ’em up and head ’em out. We go west on I-8 through Yuma and cross what’s left of the Colorado River and we’re in California. And we just gained an hour. We go north on Ogilvy Road, County Hwy S34 past the American Girl and Tumco mines in the Cargo Muchacho mountains where we spent an entire day two years ago. Further north, winding some now, the road heads to Blythe. Several miles south of Blythe we see the turnoff for Milpitas Wash Road and I tentatively suggest that we try it again, in the daylight this time. For our in-the-dark trip up that road, you can check out my blog post for February 1, 2013. Larry is still not terribly excited at the prospect and I wisely don’t say any more. When we pass the Bradshaw Trail we know we are almost to Blythe. On into town we go. We already know where the bank is, the supermarket, the laundromat, and the park with free water. We stock up on food, gas, diesel, and water then drive west about 20 miles on I-10. The rest stop at our exit is open now, after being closed two years ago and the solar power plant appears to be completed, so maybe we’ll be able to go north from here to do some exploring. But for now we have to go south, down three miles of good paved, high-speed road till suddenly the good road goes to the right to the state prison and our road goes straight for another six miles. The road is wide, it is graded from time to time, but receives enough traffic that it is badly washboarded. The speed limit is 15 mph but with the trailer, we crawl along at walking speed. 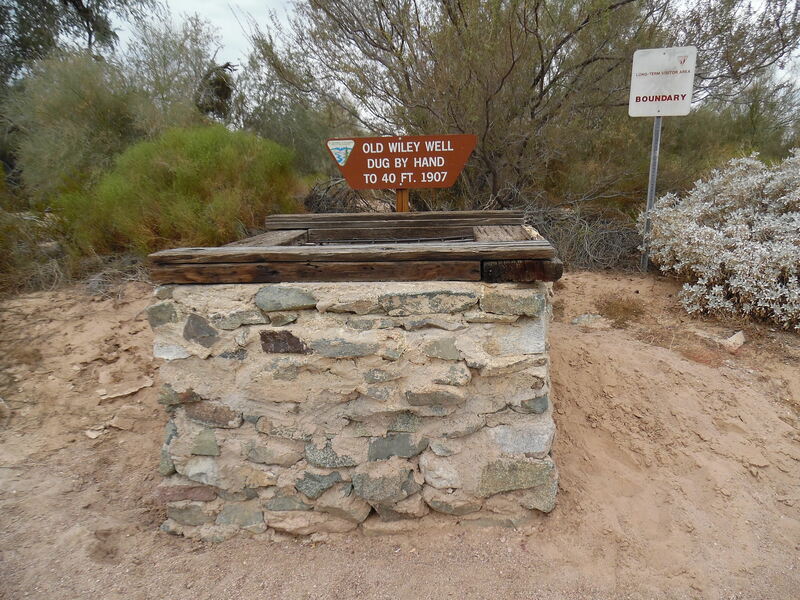 At long last, we come to Wiley’s Well Long Term Visitor Area, where you can dry-camp for 6 months for $180 or 2 weeks for $40. Considering that full hookups now often cost $40 a night, we can put up with a little inconvenience for the beauty, the quiet, and the dozen or so other campers here. We get just enough cell signal that we can check Facebook and email but can’t send anything out. Not to worry…when we tire of being cut off, we’ll drive into Blythe, visit a fast food restaurant, and take our time getting caught up with free wifi. For now, we’re just happy to be back at one of the most peaceful places we’ve been. 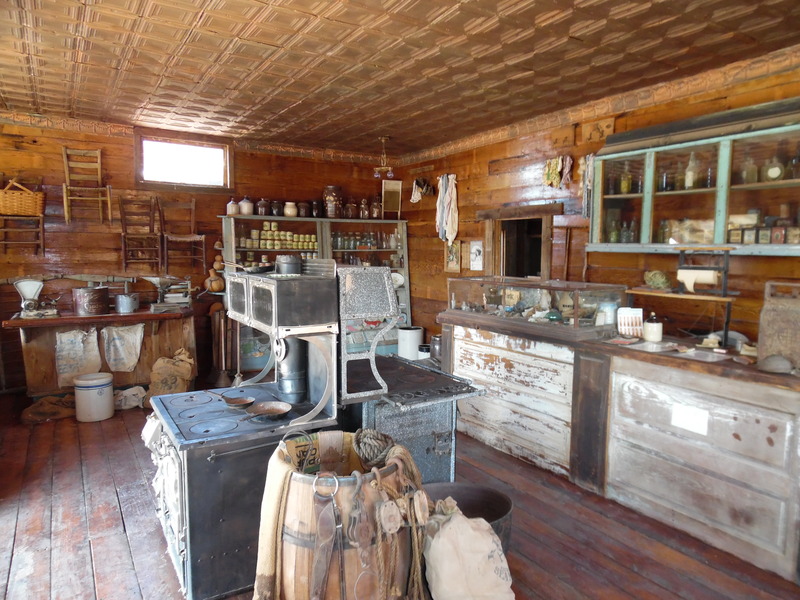 What are the chances a little ghost town would be open for tours on New Years Day? But it is, so off we go. Right back up the road past the Yuma Proving Ground closer and closer to the funny looking mountain we saw yesterday. My tiny bit of understanding of geology suggests that it’s the core of an ancient volcano with a great deal of the original sloping mountain eroded away. We soon discover it is known as Castle Dome Mountain. It dominates the landscape as we drive north but then something else captures my attention. “We’re actually catching up with that plane.” “It’s probably a chopper, it’s going so slow.” “No, I think it’s one of those blimpy things. But it’s strange…it’s painted funny. It’s dark on the bottom and light on the top.” A few miles later, it is obviously a tethered blimp, similar to the one we saw at White Sands two years ago. It isn’t painted funny…it is pure white all over but the sun was so bright the shadows were very dark. About ten miles up a very well graded gravel road we come to the re-created ghost town. It turns out that Castle Dome and the hills below it were laced with silver and lead. As many as 80,000 people dug holes and blasted shafts all over those hills. Over time, most traces of them have gone away, so someone started saving what was left and put it together in a well-done collection of old buildings and their furnishings. There is also a portion that is as it was, mine shafts and all. As we’ve heard before, miners were really good at digging holes. They were pretty lousy at filling them back in. Nobody in their right mind should go poking around old mine shafts, shored up with now rotten timbers. The “Arizona Road & Recreation Atlas” shows us a neat road…actually a continuation of the ghost town road. It wanders around through the hills, into the Kofa Wildlife Preserve, and back out to the highway many miles farther north. Why not? We’ve gone a couple of days now without any real adventure, so let’s take this road and see what we can see before it comes back out on the highway at Stone Cabin. It’s a lovely road, winding high along the bajada…the sloping land at the base of the hills. We’re up a couple of thousand feet and oh, by the way, it’s cold! Back at the ghost town, there was a fire burning in the woodstove of the office/gift shop and it felt wonderful. That sharp north wind is still blowing and whistling through all the cracks in the wooden buildings. We said more than once we were glad we didn’t have to live in cabins like those. But our truck is warm, the scenery is beautiful, and the road deteriorates rapidly. Nah…we don’t need another adventure like that. So back down our lovely wandering road, down the gravel road, back out to US 95. 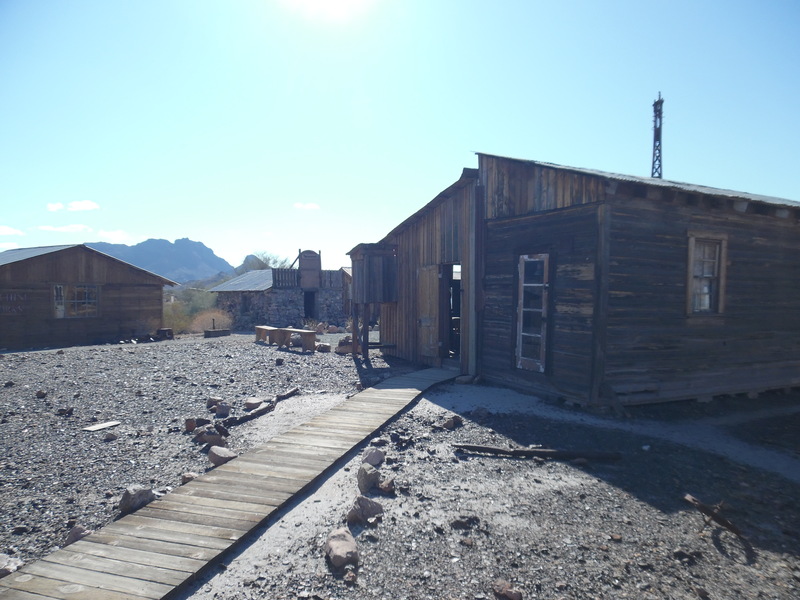 Do we turn left and head back to Yuma or turn right and find out what remains at Stone Cabin? We turn right. The highway is quiet. Maybe it’s too early on New Years Day for revelers to be out and about. We enjoy the scenery at highway speeds and finally come to Stone Cabin. It was, depending on the story you read, built by early explorers at the end of the 18th century or by someone else in the mid-19th century. Anyway, there isn’t much left of it now but for years it was the only stop along that road and always a welcome sight to travelers, regardless of the century. Two women, I think sisters, owned it and operated a cafe there for much of the 20th century. Now, it is almost hidden by an adobe-appearing building, a few RV’s, a mobile home, a gift shop, an ice cream stand, and a hamburger stand, all run by the same ex-Marine. You can get the world’s messiest burgers, with all manner of accompaniments, scrumptious fries, and at least two days’ allotment of cholesterol for a really reasonable price. Make sure to grab plenty of napkins and plan on a bath at your first opportunity. Man, talk about tasty! Lunch and supper in one burger.